Tewodros Asfaw won a tactical race spent tailing his countryman Mesfin Lemma in the initial stages of the four-lap tour of Amman's historical centre. As the early leaders tired from the deceptive inclines Asfaw move ahead to win by a full kilometre. Jordan's Olympic Marathoner Methqal Al Abady came through for third in just under 2:30. 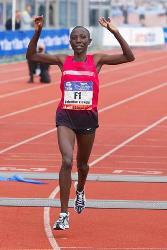 Mihiret Antoiyos led from gun to tape to claim a second Ethiopian victory. Switzerland's Maya Chollet took second in her debut Marathon ahead of local athlete Razan Mokbeal. Suhail Nashash became the first visually impaired Jordanian to run a marathon (3:27:16). 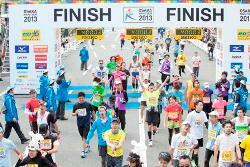 Over 7000 runners ran the associated 10km. Both races finished at the Roman Amphitheatre built in 166 AD where HRH Prince Firas bin Raad, Chairman of the Board of Run Jordan honoured the winners, after he had completed the 10km event. The race is organized by a newly launched NGO, Run Jordan, in cooperation with Greater Amman Municipality. Run Jordan aims to promote long distance running and healthy lifestyles among all segments of Jordanian society. It started with a programme for training young runners who competed in a 4.2km race held before race registration opened earlier in the week. 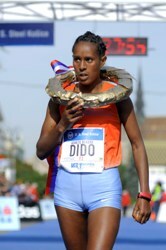 Ethiopia's Ashete Dido set a women's course record and three men broke the 2:10 barrier in Europe's oldest Marathon. Starting in cool conditions (6°C) Dido took more than three minutes off her personal best set when finishing second in Rome last year. Her compatriot Marta Lema improved by almost three minutes in second place. The lead group passed halfway in 1:13:43 but from 25km the pair were on their own, passing through 35km in 2:02:12 before Dido pulled away in the closing stages of the race. The halfway point in the men's race was reached in 1:04:33 by pacemaker David Kibet and there were still seven men together at 36km when Ethiopia's Alemayehu Abebe surged ahead. But the Kenyan pair of Patrick Kiptanui Korir and Elisha Kiprop worked together and started to reel in Abebe 3km from the line, to set up a thrilling end to the race. The 36-year-old Kiptanui Korir, the 2012 Madrid Marathon winner who only started running international races at the age of 30, proved strongest, but all three set personal bests. 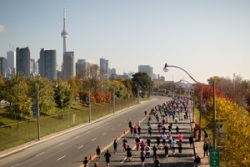 An estimated 9500 competed in the races. 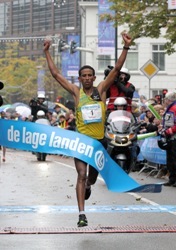 Ethiopian favourite Yemane Tsegay Adhane won a thrilling battle and ended a 14-year Kenyan winning streak in the Dutch city writes Phil Minshull. Heavy rain ruled out any course record but there were still three men in contention with a kilometre to go. Adhane surged as the trio entered the old market area in the centre of Eindhoven and shook off his compatriots Bazu Worku and Belay Assefa. The weather forecast had changed dramatically less than 24 hours before and the race started in driving rain, a strong breeze and a temperature of just 6°C at the start. 14 runners, including four pacemakers, went through halfway in 1:04:11 but then started to drop off. Six remained at 25km, passed in 1:15:48: Adhane, Worku, Assefa and Sisay Lemma along with their Kenyan pacemakers Timothy Kiptoo and Sammy Kigen Korir. 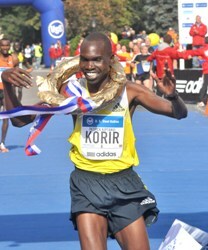 Kiptoo dropped out but Kigen Korir carried on driving the pace as they went through 30km in 1:30:59. He continued to the finish, but once he finished pacing the Ethiopian quartet started to race more tactically. Lemma lost contact from 39km. 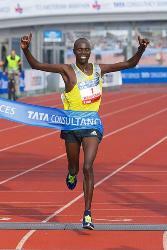 A titanic battle among three Kenyans played out on the streets of Cologne until the final kilometre. None of them were able to break away until shortly before the finish line when Nicholas Chelimo summoned the strength to get clear. By contrast Janet Rono led the women's race from the start to break her personal best by four minutes. 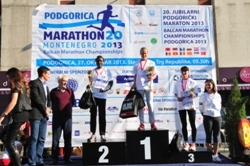 Serbia's second city the capital of the Autonomous Province of Vojvodina, staged its 19th edition of the marathon over a flat course starting and finishing at city's very core — the square in front of City Hall. The course is mostly along the banks of the Danube and over newly constructed or reconstructed bridges. It leads through newly-built districts, the University precinct, beside the Tanurdzicevapalata, the beautiful old palace which houses the Assembly and Government of Vojvodina, and past the famous Petrovaradin Fortress. 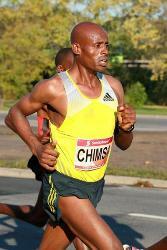 A new course record was set today at the 34th Annual GoodLife Fitness Victoria Marathon by Kenyan, Lamech Mokono. Running under brilliant, sunny skies Lamech Mokono set a new course record, while local runner Catrin Jones set a personal best in the women's race and 10 age-group records were also set. Over all four events, 11,768 registered (10,263 finished) with 2008 (1696 finished) in the Marathon and 5471 (4659) in the Half Marathon. The Thrifty Foods Kids Run (1300 entries) sold out for the second year in a row. Kip Kangogo took an early lead in the men's race followed by 2011/12 champion Thomas Omwenga, Josephat Ongeri and Lamech Mokono. At 10km Mokono took the lead as Omwenga slowly dropped out of contention. At 30km Mokono and Kangogo were still together bul Mokono went ahead at 32km and with 5km to go started widening the gap to eventually break the 2011 course record by 51 seconds. Oliver Utting, in fifth was first Canadian and top master, becoming British Columbia Champion. Local favourite Catrin Jones took the lead from the start which she claimed afterwards was "worrying" but "At the 24km turnaround I saw Katherine (Moore) and pushed a little more". 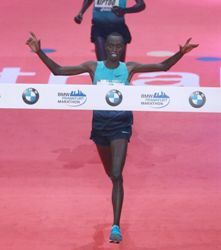 Wilson Chebet secured a third consecutive victory and improved the course record by five seconds. Valentine Kipketer posted a personal best to win the women's race. A group of about 20 started fast, on course record schedule until 15km, but then a headwind next to the Amstel slowed them. It was only after 34km that a magnificent battle started between Bernard Koech and Wilson Chebet. This lasted until 38km when Koech cramped, giving Chebet a clear path to his hat-trick of wins in Amsterdam. Behind Kipketer Serena Burla took a surprising second place. Having survived her battle against cancer and she ran with golden shoelaces in support of the VUmc charity marathon for Cancer Center Amsterdam. There were more participants than ever before in the Olympisch Stadion. 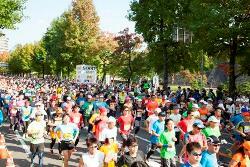 An incredible 41,600 runners in cluding 17000 foreign runners from 82 countries entered the various races (marathon, Mizuno Half Marathon, TCS 8km and the childrens run) up 4,500 on last year. Tadese Tola broke the 33-year old course record and pulled the Kenyan pair Bernard Kipyego and Daniel Rono under the old mark, Taisuke Kodama's 2:07:35 from 1986 writes Mirko Javala. The weather was perfect for a Marathon with clear skies, minimal wind and a temperature a little over 10°C. The men passed halfway, led by Festus Langat, in 1:03:35 with a group of 11 still together. 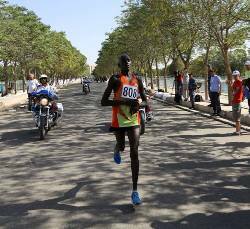 Tola kicked at 24km and was followed by Kipyego as the group thinned to five, and passed 30km in 1:30:14 and 35km in 1:45:38. Led by Tola, the top five reached 25km in 1:15:03 with Kipyego in second place followed by Ethiopians Abebe Negewo and Afewerk Mesfin and Kenya's Daniel Rono. The same personnel were still in the lead at 30km in 1:30:14, but soon after Mesfin was dropped from the group, and Negewo dropped back after 37km Tola and Rono began to sprint with 900m to go, but with 500m left Kipyego had joined them and all three were going full throttle, a sight not often seen in the Marathon. 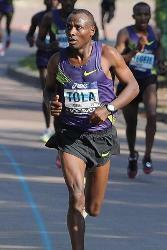 With 150m to go Tola finally broke clear. The women's race was considerably thinner, with only a handful of runners competing for the top places. Just 23, Zhang had not competed for more than four years, since finishing 18th in the 10,000m at the 2009 World Championships in Berlin. Her first race in Beijing came in 2007 when she was a surprise runner-up in 2:27:20 at age 17 and then ran a world junior best 2:22:38 in Xiamen in January 2008, a day after her 18th birthday. Her 2009 performances were no longer as good, and her career drew to a halt. After 30km (1:47:24) with Zhang now clearly looking to take the lead and at around 36km she finally stepped up a gear with Yeshimebet Tadesse falling back quickly and Makda Harun able to hang on for just a few more moments. Perfect weather and the deepest world-class field ever assembled in Canada delivered a course and Canadian all-comers' record in the 20th edition writes Paul Gaines. 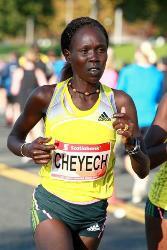 Pre-race favourite Deressa Chimsa beat the former record by 53 seconds. An eight-man pack passed halfway in 1:03:15 before it began to disintegrate but, with the temperature at 10°C, hopes were still high for a fast time. Pacing finished at 30km leaving Chimsa, Habtamu Assefa and Solomon Kiptoo running into the wind. 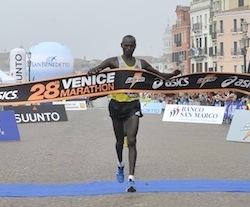 Kiptoo surged and Assefa was dropped but Chimsa remained composed and retaliated by surging up an incline to put distance between himself and Kiptoo, which only increased over the final stages. Chimsa's training partner, Sahle Warga, the defending champion, faded to seventh after complaining of a pain in his hip. Flomena Cheyech ran wisely as the lead women went through halfway in 1:11:53, but by 24km she found herself in the lead with nobody willing to push the pace. While the others slowed, she just powered away from the field. "When I looked around at 24km there was nobody who wanted to come in front and when I arrived at 30km there was [still] nobody so I motivated myself to keep going on." The early pace destroyed many of the leading contenders leaving Ethiopian Sechale Adugna to claim second. The Toronto crowd were delighted to see Canadian internationals Lanni Marchant and Krista DuChene duelling to beat the 28-year-old Canadian record of 2:28:36. Both of them did it, but Marchant finished in third place, 32 seconds ahead of her friend and rival. They were greeted at the finish by Sylvia Ruegger, whose record they had finally beaten. They both improved about three minutes over their previous best times. About 7000 peace lovers and runners of 54 different nationalities participated in the third edition of this race held in the capital of Iraqi Kurdistan. 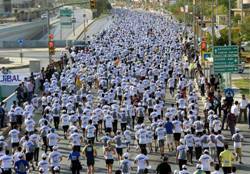 The marathon is organised by the Iraqi Kurdistan NGOs Network "IKNN" in cooperation with the Erbil Governorate. There were three races: full marathon, 10km and 4km (a family fun run). Men and women, children and the handicapped from all over Iraq and the world came to the historic city of Erbil to run for peace. The weather, the organization and the course were enjoyed by all. At the finish line the music, songs and dances kept people happy and excited as the winners' achievements were recognised and medals and prizes presented. 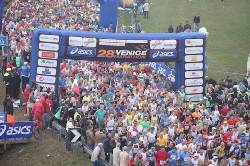 More than 20000 runners enjoyed an autumn tour of the beautiful scenic lakeside course. Nickson Kurgat broke his personal best to win his second Chuncheon Marathon. Last year he was second to David Kemboi Kiyeng but their positions were reversed this year. Vincent Kipruto braved high winds to beat fellow-Kenyan and debutant Mark Kiptoo by just one second writes Pat Butcher. 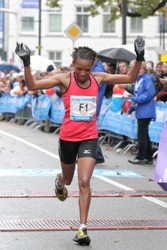 Caroline Kilel ran a personal best for her second Frankfurt victory. 14,964 runners from 96 nations entered among whom were five men with personal bests of under 2:05:30 and three women who had run sub-2:22. But winds of up to 50km/hour blew away any hopes of a fast time. as 14 runners passed halfway in 1:03:06. Then, without any pacemaker left, runners tried to shelter behind each other and the pace dropped. Kipruto led a group of six at 30km (1:29:21) as they expected to benefit from a tailwind, but the wind swirled and provided no assistance. Kipruto pressed on to have only Kiptoo alongside him at 34km. Shortly before they entered the Festival Hall for the final 100m, Kipruto made the decisive break to finish just one second ahead. The Ethiopian challenge never materialised. Feyisa Lilesa had already fallen behind and dropped out at 37km with a back problem. Dino Sefir, the fastest in the field with 2:04:50, had lost contact with the leaders before halfway and finally finished seventh. The women enjoyed better protection from the wind by their pacemakers and with five women under 2:24 there was greater depth than any previous German marathon. Six women reached halfway in 1:11:10 minutes. Debutante Gelete Burka's hopes of a winning debut Marathon soon faded as she lost ground before reaching 25km. The other five remained together to 35km from which point Caroline Kilel began to build a winning lead, and improving her personal best by two seconds. Of the 14,155 people signed up 11,972 completed the various courses in the 20th anniversary edition. There was some rain and a light wind which hampered runners on their return journey from the turnaround at La Tour-de-Peilz-Lausanne. Maciek Miereczko retained the men's title while the women's winner was British Olympic (2nd place in Beijing) cycling time triallist Emma Pooley. A strong typhoon lingering in the southern ocean caused concern among race organisers during race week, especially as another typhoon in its wake made their respective paths very difficult to predict. Both typhoons diverted into the East Pacific Ocean and runners enjoyed cloudless and temperate conditions on marathon day. 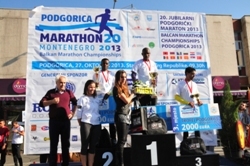 The 20th edition held in the Montenegrin capital incorporated the 2013 Balkan Marathon Championships and the 2013 and National Championships for both marathon and half-marathon. Over 400 runners, from 34 countries, took part in the races there were around 5000 participants in the eco-race and eco-marathon. Weather conditions were favourable and spirits high. Guests among the thousands of spectators included the Director of the Balkan Athletics Federation Dobromir Karamarinov and the Mayor of Podgorica Dr Miomir Mugosa. Over 9000 entered the various race distances, and in the Marathon Marina Strahl pulverized the course record. Bartoz Olszewski also broke the men's course record. Once again the Kenyans took the honors but Andrea Lalli ran a great debut marathon, sticking with the leading group until 30km when Titus Masai, Raymond Kiplagat and Nixon Machichim opened up a gap on him. Machichim built up winning a margin over the last 2km, fending off Kiplagat's desperate attempt to catch him in the final sprint. Lalli paced himself well to finish third: "when I saw Masai closer I gritted my teeth and tried to speed up my pace to finish third". 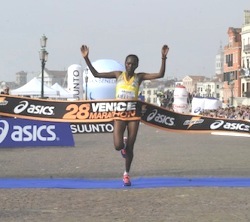 Mercy Jerotich Kibarus was a clear winner of the women's race. 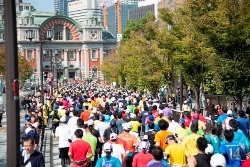 At the tail end of the race groups of Italian and Japanese runners dressed in a colorful T-shirts enlivened the race course. There were 5344 finishers. Thousands of of spectators cheered on all runners and both were entertained by music groups located in 22 different locations.